The main event of this weekend’s UFC Fight Night, in Fresno, California, is more important now than it was when contracts were first signed. With Max Holloway successfully defending his featherweight title against Jose Aldo for a second time and Frankie Edgar out for a while with an orbital bone fracture, the winner this weekend could find himself contesting for the title in his next outing. 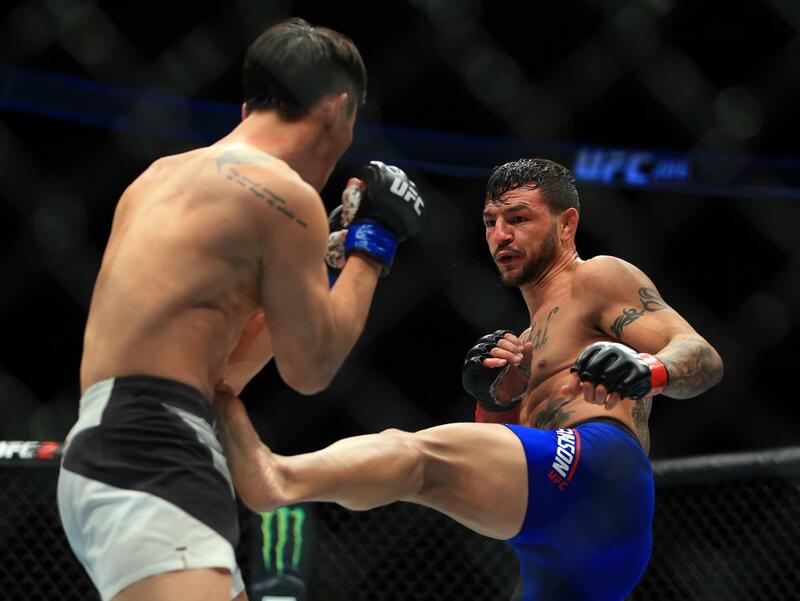 Perennial featherweight contender, Cub Swanson, looks to add a fifth victory to his current winning streak by beating one of the division’s new faces in Brian Ortega. Ortega is a fighter who has already shown plenty of potential in the Octagon but has clearly not realised it to its fullest. Still unbeaten after 12 professional fights, Ortega is a dangerous submission artist who has discovered his striking power since signing with the UFC. His Gracie Jiu Jitsu black belt has forced his opponents to tap out in half of his bouts. Then, in his June 2015 ‘Fight of the Night’ war with Thiago Tavares, he showed good head movement and takedown defence and finished with a flurry of punches. Jump forward almost exactly 12 months to UFC 199 and he is knocking out Clay Guida with a beautifully timed knee, with only 20 seconds left in the fight. He had a triangle win over Diego Brandao in-between those fights and is coming off guillotine win over Renato Moicano this summer. The kid is certainly on a roll and with four back-to-back wins in the UFC, it’s clear that he needs to look to the top five for a challenge. Then steps in Cub Swanson. A 32 fight veteran with equally threatening skills in all ranges. His experience is a huge advantage going into this fight but it’s how he uses that experience that is key to his success. Swanson has only lost to the best fighters in the division and has been within the top few of the division since coming over to the UFC from the WEC in 2011. Before this current four fight streak, he suffered consecutive losses against Edgar and Holloway, with both defeats coming via submission, a possible weakness which must give Ortega confidence. Following those two losses many people felt that Swanson’s time contending at the top of the division may be coming to an end. With wins last year over Hacran Dias and Tatsuya Kawajiri, Cub found himself in another pivotal match-up. At UFC 206 in December he was set to face “The Korean Superboy”, Do-hoo Choi, whose only loss was a two-round split decision loss back in 2010. He might as well have been unbeaten and he was riding a streak 12 victories long, with 10 of those foes put to sleep before the final bell. Going into the fight with Swanson, there was a feeling that Choi was being prepared to ascend the rankings with a win over a respected veteran. In classic Cub Swanson style though, the young, talented puncher was taught a lesson in heavy hitting mixed martial arts. In what was agreed to be the best fight of 2016, Swanson comfortably bettered the “Superboy” and proved to the doubters that he was far from finished. Continuing that momentum, he put manners on Artem Lobov for five full rounds in April to win a one-sided unanimous decision. He is perfectly poised to run through one more prospect and put himself at the forefront of title conversations in the immediate future. Five round experience and a confident ‘sprawl and brawl’ style should set him up right against a Jiu Jitsu whizz with boxing skills. The danger against Ortega though, is not necessarily that high pressure, dominating style, because he is a self-admitted slow starter. He skirts the Octagon, hitting his opponents with long-range, multiple-strike combinations, and then wraps them up like an octopus when they get too close. What I find interesting is that all four of his recent stoppages all came in the final minutes of the third round, showing that he is always a threat and that he possibly gets stronger as the fight goes on. He has seen five rounds twice, both times successfully contending for title belts on the local circuit. This will be his first main event in the UFC though and the additional two rounds at this level can change the entire fight. It’s always difficult when one of these Fight Nights follows such an amazing pay-per-view event as UFC 218, but there are fights on this card that people will still be talking about at the back end of next week. The co-main event will be fought at a relentless pace, as Jason “The Kid” Knight brings his wild brawling zombie attack to the Octagon to face American Kickboxing Academy’s Gabriel Benitez. Marlon Moraes versus Aljamain Sterling should also be a very competitive bout between top ten bantamweights.